The Ohio Catholic Social Services Endowed Trust was established in 2010, by the Ohio Council of the Knights of Columbus, a nonprofit Catholic fraternal service organization. The Ohio Knights of Columbus created the Ohio Charity Foundation in 1956 as a separate 501 (c) 3 Charitable Organization. It is funded through Ohio State Council Knights of Columbus fundraisers and other donations from other entities and persons. It is an independent Ohio Corporation with its own independent Board of Directors. The Ohio Catholic Social Services Endowed Pooled Trust was established by the Ohio Charity Foundation in 2010 by an initial grant made to the Pooled Trust for the benefit of the Mentally Challenged and Elderly Ohio Populations served by each Diocesan Catholic Social Services Agency which serve all such populations regardless of religious affiliation. The Knights placed the Trust’s administration with The Center for Special Needs Trust Administration, Inc., a nonprofit corporation that administers Pooled Trust and Special Needs Trusts from across the country. To build the endowment fund, the Ohio Charity Foundation of the Ohio Knights has made annual $30,000 deposits to the Fund since 2010. The Center also made matching $30,000 contributions in 2012 and 2013. Now, dozens of Ohio residents also benefit from accounts in the affiliated OCSS Pooled Trust, to pay for extras as they receive Medicaid in their later years or SSI benefits. Any leftover funds in an individual’s account upon their death, after all other financial obligations are met, also go into the Trust’s Endowed Fund. Thanks to the generous contributions from the Knights and The Center, and from residual Pooled Trust deposits, the OCSS Endowed Trust has grown quickly—as has its funding for Catholic Social Services. Started with a zero balance in 2010, the OCSS Endowed Trust reached $2.9 million at the close of 2016. 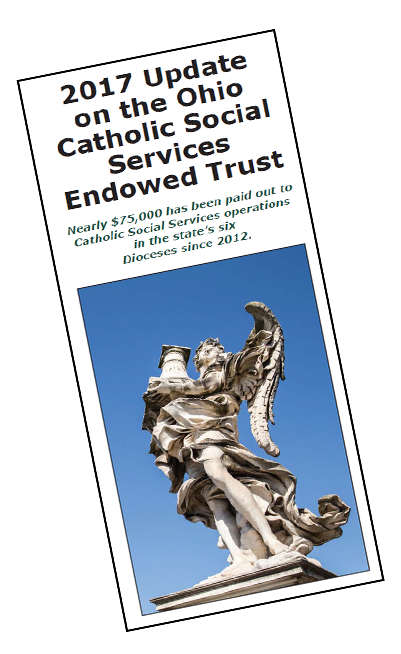 Distributions from investment returns on the Trust balance returned to the nonprofit programs of Ohio Catholic Social Services have grown from a modest $1,089 for each of the state’s six Dioceses in 2012 to $6,386 for each in 2016. The total 2016 distribution of $38,318, brought the statewide total to approximately $75,000 for Catholic Social Services programs serving the elderly and mentally challenged in the last five years. 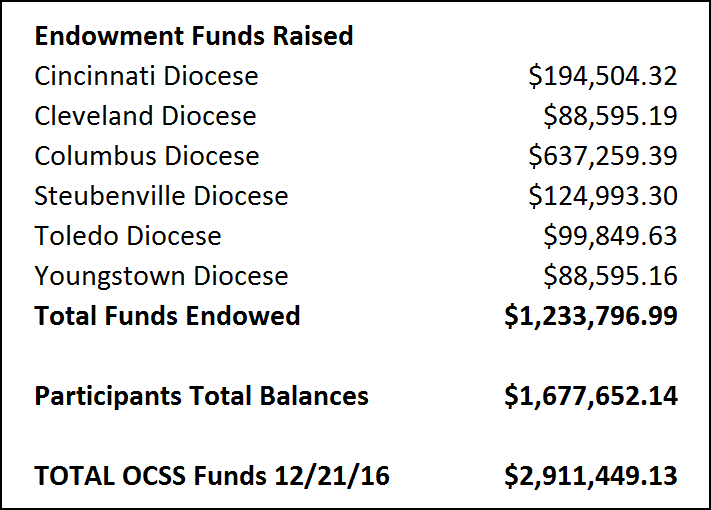 See the attached chart and 2017 Update on the Ohio Catholic Social Services Endowed Trust for more information on the charity dollars being produced.